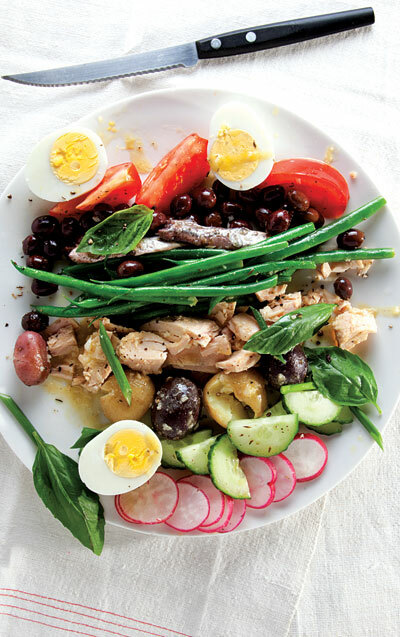 Traditionally made with local olives, oil-cured tuna, and anchovies, this protein-rich salad from Provence has become a staple of brasseries all over France. This recipe appeared in Saveur Magazine’s June/July 2012 issue. 2. Make the salad: Arrange all ingredients in separate rows on a large serving platter; drizzle dressing over all ingredients, season with salt and pepper, and garnish with basil and scallions just before serving. Preheat the oven to 375º F. Sauté the shrimp with butter and seasonings for 1 minute. Add the vermouth and boil rapidly for 30 seconds. Strew the shrimp and pan juices in the pastry shell. Pour in the custard to within ⅛ inch of the rim, and sprinkle on the cheese.